Have you ever been in an interview and felt that you lost your interviewer's attention? It's a universal truth that good listening is coupled with good eye contact, and we often look more intently at people saying things we find important. Not only is eye contact a good indicator of someone's interest, but it also has the power of persuasion. Think of an interview as an opportunity to win over a new person. It's no different than meeting a new friend or going to a networking event, the only shift is the amount of preparation that can be done. To make a great impression, the key is becoming that likable person who is aware of their surroundings; you want to be engaged but not laser-focused. Eye contact is the single best way to establish likability and trust from the minute you walk into the room, and with 93 percent of first impressions not relying on words at all, body language is a critical component. These five tips will help you leave a positive impression on your next new acquaintance. Soft and steady eye contact is the best type for a business meeting. Keep your eye contact casual -- it's warm, connected and engaged, but it's not locked in. The minute you're locked into somebody, it feels uncomfortable and unnatural. For example, let's say you're having dinner with friends and telling a story to the other four guests but really only looking at one person. It's oddly unnerving for the other guests that are not getting the benefit of your eye contact and can make them feel left out. In a meeting, it goes without question that if there is more than one person in the room, you want to connect eyes with everyone, casually, back and forth, making sure everyone feels included and leaving a lasting impression. Channel the feeling you have when you're talking to someone that you find really interesting. The eyes are the window to the soul. So, when you're getting to know somebody, use eye contact to convey your energy and enthusiasm. When you have that sort of softness, openness, eagerness and friendliness in your eyes, trust is easy to build. Trust is largely about your energy. When meeting a potential client, you have to establish who you are as a person from the moment you enter the building, so it's important to greet the person at the front desk warmly and use your eyes to connect with everyone. People want to hire people they like and trust, so sharing a glance with everyone establishes the perfect energy to set you up for an amazing meeting. This has to do with setting your intention to be very present and mindful of what you're seeing, and you can demonstrate this as a skill during your meeting. Take a moment to scan the room and notice something interesting on the person's desk -- maybe you can even mention it -- and also make sure to notice his or her eyes. This can also boost the other person's memory of you after the meeting. When I was an actress and had just moved to L.A., I walked into an agent's office for an interview and was completely blown away by the photography on the walls. Turns out, he took these extraordinary images while on a safari in Africa. Before we even sat down, we started chatting about his photography and I continued to genuinely compliment his work. The fact that I was so interested in his art set a completely different (and positive) tone for the rest of the conversation. When someone notices a sparkle in your eye that indicates you genuinely find something interesting, you create a connection that will carry into both topics that are related to your work and topics that are not related to your work. Recently, a client of mine in real estate acquisitions reached out to a real estate owner that he knew was a former senator. While they were chatting, my client asked a genuine question about the Vietnam War, and the former senator was immediately so appreciative of my client's interest in his personal life, that they instantly connected, built up a rapport and established trust with interest and eye contact. They found a common ground that could then be translated into talking about business again. Get in the habit of looking up or looking to the side versus looking down. The minute you look down, you're showing insecurity. When you look up, you're actually strengthening your energy, keeping yourself in the line of optimism, curiosity and keeping yourself open to receiving the energy of the other person. In terms of eye contact, looking up increases and invites engagement, while looking down conveys fear. Let's say that you are asked a question during an interview that you don't know the answer to. Rather than look down and cut your energy off from the other person, look up to convey that you're thinking confidently and openly. It's a subtle shift that gives you space to gather yourself. Body language expert Anne Cuddy did a wonderful TED talk about the power of your presence and how to boost endorphin-producing chemicals in your body through your stance alone. Through energy muscle testing, we've found that eye contact is similar in energy production. 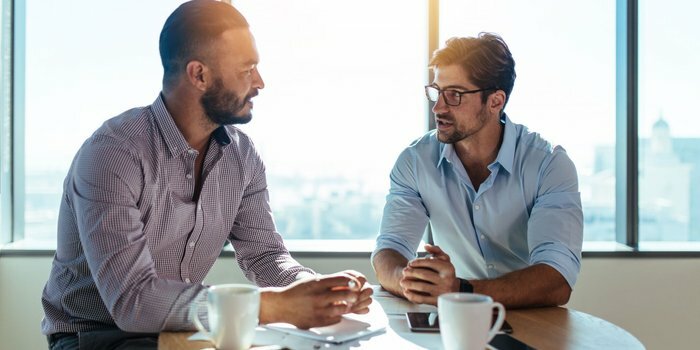 Body language and eye contact can be often overlooked, but understanding the impact of each can help you master the art of persuasion.